The amazing capital of Portugal is often found ranked among the Top 10 destinations in the world to visit this year list. So, when you visit Lisbon, you should make the most of it by booking some of its sightseeing tours. While enjoying the sightseeing, you can as well choose where to get off the bus and when to rejoin the ride. There are 3 major bus tours companies in Lisbon(Red Bus Gray Line or Yellow Bus or Gray Line), depending on the chosen ticket, you may also benefit from certain discounts and complimentary rides. Available audio commentaries in most widely spoken languages in the world are just one of many additional conveniences. Therefore, choose a tour that suits you best and enjoy your Lisbon sightseeing. You have the flexibility to choose a line or combine both in 24 hours after the first validation. The holders of the ticket are entitled to certain discounts at participating restaurants, shops, and attractions. Discover Lisbon with a 48-hour (2-days) hop-on-hop-off bus tour pass and also enjoy Tagus River hop-on hop-off Cruise linking some of Lisbon's major attractions. Travel along 3 bus routes and also use the city's trams, funicular, Santa Justa lift, and the Aerobus to Lisbon Airport. Excite yourself with views of a lot of memorable places on the Targus, Olisipo and Belem Bus Tour routes with stops at Jerónimos Monastery, Coach Museum, the Belém Tower, Padrao dos Descobrimentos, Lisbon Oceanarium, the Amália Rodrigues Museum, and more. Get on the Yellow Boat Tour and cruise past the April 25th Bridge,St. George’s Castle, Sé Cathedral etc Come ashore and continue your sightseeing tour around the remaining stops. The tour takes care of your transportation around the city, allowing you to explore and discover Lisbon with a lot of discounts. Certain discounts at participating attractions, stores and eateries. June - September: from 9:00am to 8:00pm and 7:00pm to 8:00pm. October - May: From 9:00am to 5:30pm. Olisipo Bus Hop-On Hop-Off Tour: April 15th - October: From 9:00 am to 7:00 pm. November - April: From 9:15am to 5:45pm. Belém Bus Hop-On Hop-Off Tour: From 10:40 am to 5:40 pm. Yellow Boat Hop-On Hop-Off Tour: April 15th to October 31st: From 10.00am; 1.00pm; 3.00pm; 5.00pm. November to April 14th: from 10:00am; 11:00pm; 1:00pm; 2:00pm; 3:00pm; 4:00pm; 5:00pm; 6:pm. Tagus Bus Hop-On Hop-Off Tour: June - September: Departs every 15 minutes, and every 30 minutes in the evenings. October - May: Departs every 20 minutes. Yellow Boat Hop-On Hop-Off Tour: every 2-3 hours. Audio commentary Yes (12 languages) Spanish, Swedish, Chinese, Dutch, English, French, German, Italian, Japanese, Portuguese, Russian, Mandarin. Flexibility to take off and board the bus at any stop throughout the city at any time. Free ride on Caris'trams during the validity period of the ticket. Discounts on participating attractions, restaurants and shops. Cancel your ticket 24-hours before the tour to get a full money refund. Present your paper voucher to the bus driver or at the Praça do Comércio Yellow Bus kiosks to get your Yellow Boat Tour ticket. How to use You have to present the printed voucher to board the bus. Both mobile and printed vouchers are valid. Present your electronic or printed voucher to get on board. Only paper printed vouchers are acceptable. Where to Buy Lisbon Yellow 4 in 1 Hop-on Hop-off Bus and Tram Tours? We are comparing the Best Lisbon Hop On Hop Off City Sightseeing tour Prices from leading online Tours and Ticket suppliers, try to find you cheap tickets prices on the market. Where to Buy Lisbon Grayline Hop-on Hop-off Tour? 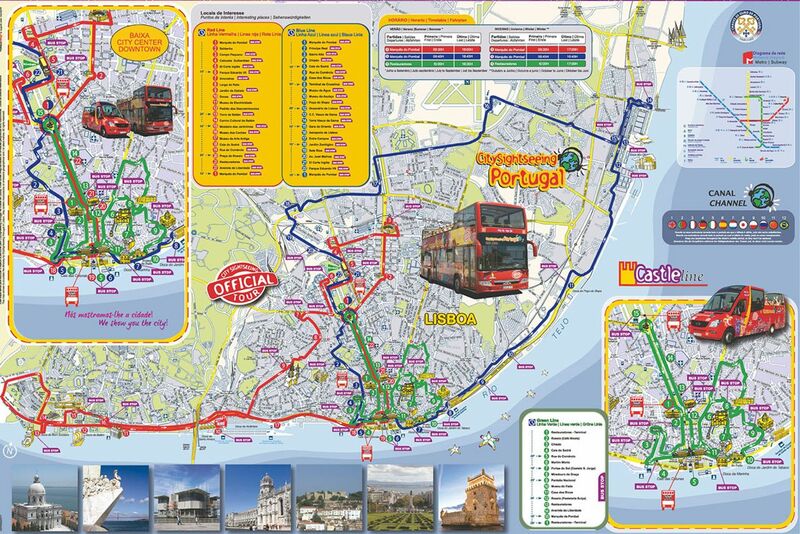 Where to Buy City Sightseeing Lisbon Hop-on Hop-off Tour? We are comparing the Lisbon Hop-on Hop-off Bus & River Tours Prices from leading online Tours and Ticket suppliers. Explore Portugal's capital with the Lisbon Hop-On Hop-Off Gray Line Bus and Cascais in a choice open-top double-decker tour bus with either the 24 or 48-hour tickets. This tour comes with a complete audio guide that explains the attractions along every stop as well as the historical information about the city. With 4 different routes, you will explore Lisbon at your own pace however you want to either by taking a walking tour when you hop-off at any of the stops and hop-on at the next stop. Take advantage of the optional Cascais line which lets you into the magic of the Lisbon city. It never gets better! Get discounts on many major attractions like monuments, museums, shops, and restaurants. You get a Lisbon Map guide as well. You get an option to explore Cascais. Hop-on and Hop-off at any time at any of the stops to walk around on your own. With the ticket, you get discounts on attractions such as monuments, museums, restaurants, shops, and leisure activities in Lisbon. How much is a 1 Day Lisbon Hop-On Hop-Off Gray Line Bus? All children under 5 years ride the Gray Line open bus for free. We are comparing the Best Lisbon Grayline Hop-on Hop-off Tour Prices from leading online Tours and Ticket suppliers, try to find you cheap tickets prices on the market. Bus stops: Marquês de Pombal, Parque Eduardo VII, Avenida da Liberdade, Restauradores, Rossio, Comercio Square, Casa dos Bicos, Fado Museum, Portas do Sol, Lisbon Cathedral, Alfama, St. George Castle, St. Vincent Church, St. Anthony Church/Museum, Design Fashion Museum. Bus stops: Marquês de Pombal, Avenida da Liberdade, Restauradores, Rossio Square, Comercio Square, Cais do Sodre, Coach National Museum, Archaeology National Museum, Naval Museum, Berardo Museum, Jerónimos Monastery, Belem Tower, Monument to the Discoveries, Alcântara/Docks, Ancient Art National Museum, Oriente Museum, Basílica da Estrela, City Museum, Electricity Museum, St. Anthony Church, Fernando Pessoa House, Saldanha, Campo Pequeno, Calouste Gulbenkian Museum, El Corte Ingles, Parque Eduardo VII,Design Fashion Museum, Puppet Museum. 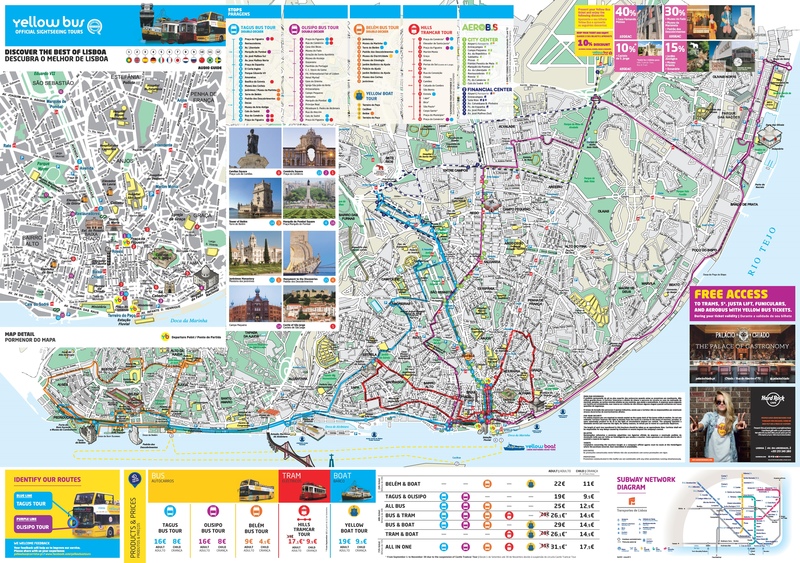 Bus stops: Marquês de Pombal, El Corte Ingles, Twin Towers, Lisbon Zoo / Sete Rios, Oceanarium, Lisbon Casino, Vasco da Gama Shopping Centre, Vasco da Gama Tower, Gare do Oriente, Poço do Bispo, Tile Museum/ Madre de Deus Convent, Estação de Santa Apolónia, Museu do Fado, Casa dos Bicos, Rua do Comercio, Chiado, Bairro Alto, Príncipe Real, Botanical Garden, Water Museum, Military Museum, St. Roque Church/Museum, National Pantheon. Bus stops: Marquês de Pombal, Carcavelos, Estoril Casino, Cascais Bay, Guincho (Oitavos Fort 1. ), Guincho (Porto de Santa Maria Restaurant 2. ), Guincho (Orbitur Campism Site 2. ), Cascais (Boca do Inferno), Casa das Histórias Paula Rego (Cascais), Monument to the Discoveries, Jerónimos Monastery, Berardo Museum, Naval Museum, ArchaeologyNational Museum. The Lisbon Hop-On Hop-Off Gray Line Bus is an in-depth way of getting accustomed to the Portuguese capital city. With just a ticket, you can explore far and beyond this beautiful city with 4 lines such as Belem, Lisbon, Cascais, Castle and Oriente lines. Once on the bus, you get access to headphones and an audio commentary in 14 different languages while also enjoying the free-on-board Wi-Fi service. With the Lisbon Hop-on Hop-off Gray Line Bus, you also get to see top attractions in Lisbon and also get discounts on attractions, restaurants, and activities in the city. Hop-on and off 30 stops and learn more about the city's history and culture as you walk further on your own to explore the stops on foot. This is a great way to enjoy Lisbon in under 24 or 48 hours, it is up to you to create your itinerary at your own pace. Is the Hop-on hop-off Lisbon Gray line Right for Me? This Lisbon Hop-On Hop-Off Gray Line Bus is the perfect thing that will happen to you if you ever decide to explore the Portuguese capital city. With this ticket, you get free Wi-Fi onboard, and audio guide to put yours through all you need to know about the city and its attractions while seating comfortably in the open-top double-decker bus. You also get discounts on attractions, monuments, restaurants, and shops as well as a tour map guide if you ever want to hop-off at any of the stops to explore on your own. What more can you wish for? If you want to go all-in and deeper into the Portuguese capital city's numerous attractions, you can embark on 3 tours to get a panoramic view of the city of Lisbon. You get to explore the city's attractions on the hop-on-hop-off bus, yellow boat tour and also tour Lisbon using one of its old means of transportation, the Tram. With this ticket, you get access to 3 open-to buses, free airport transfer, public tram rides, free access to the Aerobus and free entrance into the Santa Just lift and Lisbon funiculars with numerous discounts to visit monuments, museums and any leisure activities you wish to involve in. You get a Map guide of Lisbon's top attractions with information about them. You get free access to public transportation, national monuments, Santa Justa Elevator and Lisbon Funiculars. With the ticket, you get discounts at monuments, attractions, Hardrock Cafe and leisure activities in Lisbon. TripAdvisor: A total number of 1,665 who have embarked experienced the Lisbon adventure left reviews. 21% left an excellent review rating, 34% believe it is a very good experience while 14% say it is average. Going by the reviews, the number of satisfied past users outweighs the total number of dissatisfied ones; this, therefore, means it is an impressive review. Viator: Those tourists who booked tickets on Viator left their own impressive reviews based on past experiences. The Lisbon Yellow Hop-On Hop-Off Bus, Boat, and Tram Tours have a 4.5 rate with an overall number of 13 past users. Get Your Guide: Other people who got their tickets for the Lisbon Yellow Hop-On Hop-Off Bus, Boat, and Tram Tours through this website rated it a 4.3 (438 reviewers) rate. How much is a 1 Day Lisbon Yellow Hop-on hop-off Bus, Boat, and Tram? All children under 4 years ride for free. The Lisbon Yellow Hop-On Hop-Off Bus, Boat and Tram Tours is an all-around way of exploring the city of Lisbon in 3 days. This is a sure way to get the full excitement you deserve as a tourist in Portuguese capital city. With this tour ticket, you get free access to public transportation, trams, boat cruise, and the yellow open-top double-decker bus tour around the city's monuments and attractions with audio guides in 12 different languages. You also get discounts at monuments, museums, and Hardrock cafe, you get to use the city's famous Santa Justa elevator and many more. This is one of the best ways to enjoy your vacation in Lisbon. Is The Lisbon Yellow Hop-On Hop-Off Bus, Boat and Tram Tours Right for Me? This Lisbon Yellow Hop-On Hop-Off Bus, Boat and Tram Tours is the right tour for tourists who want more than just sightseeing. With this tour ticket, you get to learn more about the history and culture of the city, visit historic places, monuments, museums, hop-on and off trams, the yellow bus and boat. This is surely a 360-degree view of the Portuguese capital Lisbon and it is the right way to enjoy your 3-day tour. Lisbon is the capital city of Portugal. This beautiful city has beautiful sights to see and is home to a number of great people from all walks of life. To enjoy a tour of Lisbon city, you have to get on the City Sightseeing Lisbon Hop-on Hop-off tour. This tour service offers you quality service and takes you round most of the sights you wish to see. You get to plan your own itinerary to explore the city at your leisure time in a comfy open-top bus with a panorama of the city in your sight while listening to facts about the Portuguese capital from the onboard commentator. With the ticket, you get discounts at restaurants, shops, and attractions in Lisbon. How much is a 1 Day City sightseeing Lisbon Tour? All children under 5 years ride the yellow open bus for free. We are comparing the Best City Sightseeing Lisbon Hop-on Hop-off Tour Prices from leading online Tours and Ticket suppliers, try to find you cheap tickets prices on the market. Praca do Rossio, and Avenida de Liberdade. A trial will excite you once you hop-on the comfy open ton double-decker tour bus as you explore Lisbon. This is an awesome way to get the best out of your trip, with 2 routes and 46 stops, you get to see all the top attractions in the Portuguese capital city. You also learn at the same time about the city while listening to the onboard commentary that gives you factual information about Lisbon's history and culture in 11 different languages. You can also hop-on and off at any of the stops to get a closer look at these sights and take photographs for record purposes. This tour shows youth the ancient Lisbon in a modern way. Is the City sightseeing Lisbon tour Right for Me? This City Sightseeing Lisbon Hop-On Hop-Off Tour is right for you, your family and friends all together. This tour takes you on a journey that covers the whole city's top attractions and you never get to miss any moment. You can hop-on and hop-off at any of the stops to walk and see the attractions closer at your own pace. You also get to learn new things about the city's historical background and culture including facts about the attractions. Visit museums and many more places. This is truly the right tour for you if you plan on visiting Lisbon. Explore the Portuguese capital city on a hop-on-hop-off bus and Tagus River hop-on hop-off Cruise tour with a 48-hour tour ticket. The open-top double-decker bus travel along 3 routes; the Targus, Olisipo and Belem Bus Tour routes including a 1h 30 minutes Yellow Boat River Cruise along the Tagus River. Visit top attractions and landmarks along the tour routes with stops at Jerónimos Monastery, Coach Museum, the Belém Tower, Padrao dos Descobrimentos, Lisbon Oceanarium, the Amália Rodrigues Museum, and more. With this Lisbon Hop-on Hop-off bus & boat tour, you get to also enjoy discounts at select restaurants, attractions and shops. Never worry about your transportation, because your ticket lets you ride the Lisbon funicular, trams, Santa Justa lift, and the Aerobus to Lisbon Airport for free. What a way to explore Lisbon! There are no complimentary tours included in the Lisbon Hop-on Hop-off Bus & River Cruise. There are discounts at selected restaurants, attractions and shop included in the Lisbon Hop-on Hop-off Bus & River Cruise. How much is a 1/2 Day Lisbon Hop-on Hop-off Bus & River Cruise? NOTE: Children under 3 years ride the Lisbon Hop On Hop Off Bus and River Cruise Tour for free and must be in the company of adults. Yellow Boat Tour from Terreiro do Paço. Lisbon Hop-on Hop-off Bus & River Cruise comes packed with a lot of fun things to do in the capital city of Portugal. This 2-day hop-on-hop-off bus & river cruise tour ticket grants tourists access to the open-top double-decker bus and a hop-on-hop-off Yellow boat tour cruise along the Tagus River. On the bus, tourists get free headphones to listen to the audio commentary about the top attractions and history of the city in 12 languages. Use of Lisbon's public transport networks such as trams, funicular, Aerobus, and Santa Justa lift is also free with this pass. The combined bus and riverboat tour runs along 3 routes and40 stops such as the Jerónimos Monastery, Coach Museum, the Belém Tower, Padrao dos Descobrimentos, Lisbon Oceanarium, the Amália Rodrigues Museum, and more; with a lot of landmarks and attractions to cover. It doesn’t end there, the tour offers discounts at select shops, attractions, and restaurants making sure tourists save while exploring the city. Is the Lisbon Hop-on Hop-off Bus & River Cruise right for me? Yes! The Lisbon Hop-on Hop-off Bus & Boat Cruise pass is right for you and everyone else. With this tour ticket, you get access to some of the most amazing top attractions and landmarks in Lisbon. Get on the open-top double-decker hop-on-hop-off bus and explore the city along 3 routes (Tagus, Olisipo & Belem routes) with 40 stops across the city such as Jerónimos Monastery, Coach Museum, the Belém Tower, Padrao dos Descobrimentos, Lisbon Oceanarium, the Amália Rodrigues Museum etc. The free headphones onboard make sure you don't miss a thing with audio commentary in 12 languages, while the free Wi-Fi lets you share those wonderful moments on social media. You can also use the city's funicular, trams, Santa Justa Lift; tickets for the Aerobus to the Lisbon airport is also included. This tour takes care of your transportation leaving you with all the time you need to explore the city. Get off the bus and get-on the hop-on-hop-off Yellow Boat river cruise and see the city from the river's perspective all along the Tagus River. Complete your tour while also enjoying discounts at selected restaurants, attractions, and shops. What a way to see Lisbon! Where to Buy Lisbon Hop-on Hop-off Bus & River Cruise Ticket?